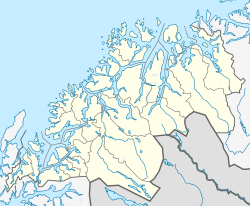 Tromsdalen (Northern Sami: Romssavággi or Sálašvággi) is an urban neighborhood in the city of Tromsø which is in Tromsø Municipality in Troms county, Norway. 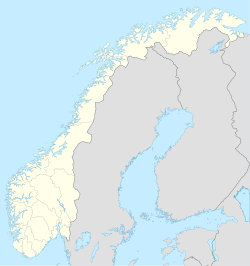 It is located just to the east of the city centre on the mainland along the coast of the Tromsøysundet strait. The 5.01-square-kilometre (1,240-acre) urban area has a population (2017) of 16,787 which gives it a population density of 3,351 inhabitants per square kilometre (8,680/sq mi). The urban area encompasses a good portion of the valley in which it is located. Tromsdalen, which literally means Troms valley, is connected to the island of Tromsøya by the Tromsø Bridge. The European route E8 highway runs through the northern part of Tromsdalen. The Tromsdalselva river flows through the valley. The Arctic Cathedral is located here. Popular attractions in Tromsdalen are the Arctic Cathedral and the Fjellheisen aerial tramway to the top of a nearby fell; the tramway ends at an elevation of 420 metres (1,380 ft) where the view is stunning. The mountain Tromsdalstinden is located at the eastern end of Tromsdalen and reaches an elevation of 1,238 metres (4,062 ft). The climb to the top of this mountain is very popular with the Tromsø residents, since mountain climbing equipment is not needed. ^ "Tromsdalen, Tromsø (Troms)". yr.no. Retrieved 2018-08-14. ^ Store norske leksikon. "Tromsdalen" (in Norwegian). Retrieved 2010-04-13. This page was last edited on 14 August 2018, at 20:43 (UTC).